Mass of Christian Burial Saturday, November 5, 2016 10:30 A.M.
Theresa Sperry, 88, of Schuyler, died Wednesday, November 2, 2016, at the Schuyler Care and Rehabilitation Center in Schuyler, where she has resided the past 10 years. 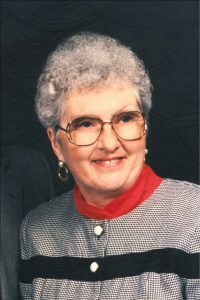 Theresa was born June 7, 1928, in Mapleton, Iowa, to John and Mary(Hupke) Theobald. She graduated from Mapleton High School and went on to Wayne State and earned her degree in Teaching from Morningside College in Sioux City. On June 2, 1956, she married Robert Sperry at St. Mary's Catholic Church in Mapleton. She taught in Manning, Iowa and Charter-Oak-Ute Schools for over 33 years. In the summer she was a farm wife, helping Robert on the farm. She enjoyed time with her granddaughters, teaching CCD, kids choir at church and loved praying the Rosary. After retirement she and Robert moved to Schuyler. She is survived by her husband, Robert of Schuyler, son John(Mary) Sperry of Omaha, daughter, Joan(Jim) Mejstrik of Schuyler, three granddaughters; Megan Mejstrik, Lincoln, Makala Mejstrik and Elaina Sperry, both of Omaha, twin sister Rita Zerwas of Manning, Iowa, four sisters-in-law; Shirley and Rosemary Theobald, Manning, Iowa, Phyllis Theobald, Chicago and Betty Vaughn of Mapleton. She was preceded in death by her parents, 6 brothers, 2 sisters, 3 brothers-in-law and three infant siblings.